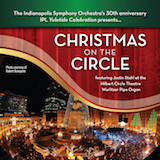 The Indianapolis Symphony Orchestra’s 30th anniversary IPL Yuletide Celebration presents: Christmas on the Circle. Celebrate the holidays with the Indianapolis Symphony Orchestra’s Wurlitzer Pipe Organ. Featuring Justin Stahl, this special holiday recording features 18 tracks, including Silver Bells, O Holy Night, Sleigh Ride and Rockin’ Around the Christmas Tree, among many other classic holiday tunes. Bring home the beloved Hilbert Circle Theatre Wurlitzer Pipe Organ today and enjoy Christmas On The Circle for many years to come! Justin Stahl began playing piano and organ at age five with the encouragement of his great-grandfather. Armed with a perfect pitch and a strong passion for music, he was mostly self-taught up through college. Justin has reached many musical avenues that have included teaching, accompanying for several choral departments, contributing as his church's Music Director, playing for community theater, and serving for over thirteen years in the Indiana Army National Guard's 38th Infantry Division Band. Most Indianapolis-natives probably had their first introduction to the theatre organ at the famed Paramount Music Palace. Justin was no different. Upon first visit at the age of twelve, he was hooked at the sound and capabilities of the instrument. Ever since, Justin has been a member of the American Theatre Organ Society and has served on the board for the Central Indiana Chapter. Justin’s partnership with the Indianapolis Symphony Orchestra has taken the form of serving as organist for the Yuletide Celebration since 2011. In that time, he has greeted literally hundreds of thousands of concert-goers with holiday favorites and requests as they enter the lobby. When not playing at the ISO, Justin can be found at theatre organ installations around the country with several bookings each year.